I don't have any pictures of outfits today or even Polyvore compositions. 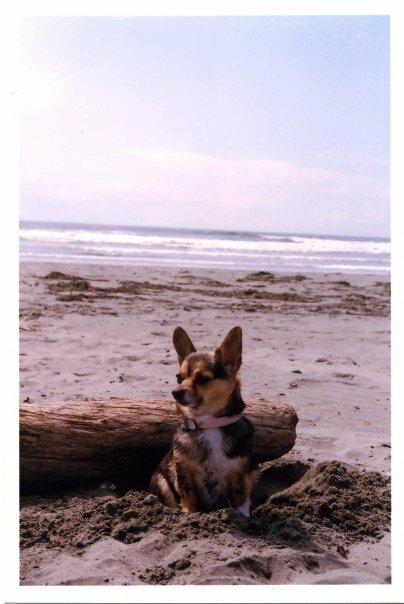 All I have is this lovely portrait of my Corgi-Chihuahua. Her name is Frida and she is much older than she looks. Anyway, I've been thinking lately: Do I buy clothes too often? How frequently do other bloggers go shopping? Maybe my habits are normal, but I do worry. Part of me is like "This is your hobby! You are being creative! You're writing!" But then there is another side that just worries about the money and the risk of over-consuming. For instance, this week I bought clothes on 3 different occasions. I went thrifting on Tuesday, shopping downtown yesterday, and then ended up at the mall today. I think I've spent roughly $80 on clothes and $30 on make-up. Doesn't sound like a whole lot, but I'm pretty sure I bought clothes last week, and the week before that, and probably the week before that. I should probably take a break for a while, because I really don't need anything! So do you consider your closet a constantly growing collection or do you focus on building a seasonal wardrobe and then calling it quits until next season? Do you shop for key pieces or are you a treasure hunter? Personally, it's mostly about the hunt for me! I love finding new things, but I love the hunt the most! I am also a treasure hunter! I love sale shopping simply for the thrill of it! I also shop quite frequently so you don't have to worry. I often do it in spurts... if I find some great things it motivates me to shop some more. I find that I shop like you for awhile, then try to save... usually the saving makes it worse because then I just binge on my next trip. I wouldn't call it a hobby for me, it is a terrible addiction haha!